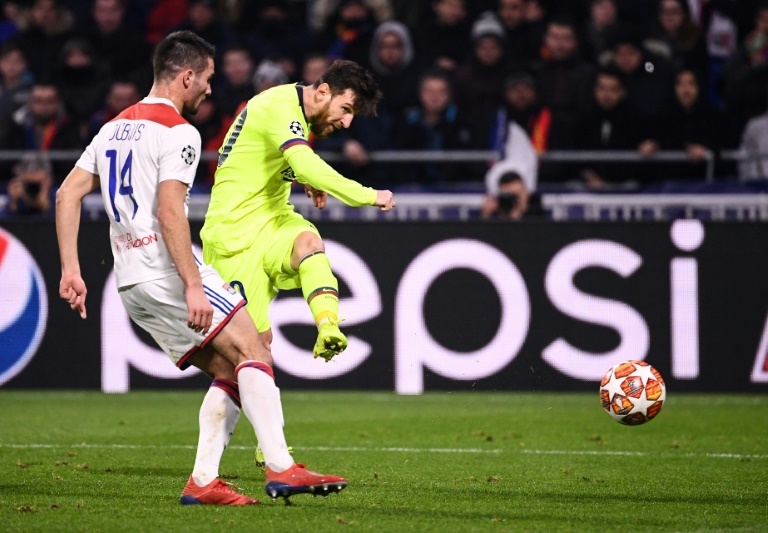 Valverde finds positives as Barcelona draw blank in Lyon to leave tie openBarcelona coach Ernesto Valverde shrugged off his team's struggles in front of goal after they were held to a 0-0 draw away at Lyon in the first leg of their Champions League last-16 tie on Tuesday. The Spanish side had most of the chances at the Groupama Stadium, with Luis Suarez firing just wide in the second half, although it was Lyon who came the closest when Martin Terrier hit the bar early on. Lionel Messi and co. were once again left frustrated on the road at the business end of the competition, and have now gone six away matches without winning in the Champions League knockout rounds, scoring just a single goal in that time. It is a run that goes back three years. Desperate to end Real Madrid's recent European dominance, Barca must now finish the job when the teams meet again at the Camp Nou on March 13, but Lyon remain in the tie. Barcelona's form needs to improve between now and then, though -- they have drawn four of their last five matches in all, and have scored just once, from a penalty, in their last three outings. "We played good football, but you have to hit the target as well, and we didn't," Valverde said. "We are on the right road, though, and the tie is still up in the air. We will try to win it in front of our fans." He added: "I am not happy with the result, but I am happy with the performance and with what we created. "We didn't score, but that is how it is. It is not easy to win away from home in the Champions League." The visitors -- who started with Sergi Roberto in midfield rather than the out-of-form Philippe Coutinho -- had good reason to be wary of their hosts, who have excelled in big games this season. Bruno Genesio's team had taken four points from a possible six against Manchester City in the group stage and recently won at home to Paris Saint-Germain in Ligue 1. They are still unbeaten in Europe this season, although this was their sixth consecutive draw. "It's a satisfying result because it leaves us with a chance for the second leg, and we didn't concede. If we can score at the Camp Nou we'll have a chance of going through," said Genesio. He admitted that he had hoped for an even better performance, but Lyon were missing their World Cup-winning captain Nabil Fekir due to suspension here. It was the 21-year-old Terrier who surprisingly started in his place, and he delivered the most exciting moment of the first half for the crowd of almost 58,000 with a thunderous strike from 20 yards out in the ninth minute that was tipped onto the bar by Marc-Andre ter Stegen. The same player later shot over at the end of a fantastic move, while Houssem Aouar had earlier been denied by the goalkeeper, but it was Barcelona who enjoyed the longer spells of possession. Ousmane Dembele -- one of two Frenchmen in the away line-up -- came closest for them in the first half, although their best chances came after he had been replaced by Coutinho midway through the second period. Suarez came within inches of breaking the deadlock 20 minutes from time, firing narrowly wide from Jordi Alba's cutback. He has now gone 16 away matches without scoring in the competition. Coutinho had a powerful shot beaten away by Anthony Lopes, with the Lyon goalkeeper also frustrating Messi and Sergio Busquets as Barcelona dominated but departed without a potentially precious away goal. "It is a little bit of a disappointment, but there is still the second leg to come and we hope to do better," said defender Clement Lenglet. At least they extended their unbeaten record against Lyon to seven matches, but there remains hope for the French club ahead of the return. were once again left frustrated on the road at the business end of the competition, and have now gone six away matches without winning in the Champions League knockout rounds, scoring just a single goal in that time. It is a run that goes back three years.